From 7.07. 2012 to 07.11. 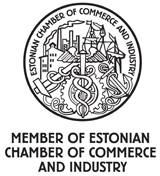 2012 Raudrohi Ltd received support from the Enterprise Estonia start-up – and growth supporting program to acquire capital assets, develop a brand and create a website.